The ex-US Navy A-4E Skyhawks, which have supplemented the initial deliveries of the A-4H version of this highly-successful little warplane, are now being fitted with the "avionics hump" which will eventually be added to all Israeli Skyhawks. An A-4E modified by the addition of the "hump” is illustrated here. A substantial number of Douglas C-47s remains in the Israeli transport inventory as the "maids-of-all-work” of Heyl Ha’Avir, and at the present time no plans exist for a replacement for this type which is scheduled to soldier on well into the mid ’seventies. Still the principal Israeli air superiority fighter, the Dassault Mirage IIICJ is marginally less manoeuvrable than the MiG-21 but Heyl Ha'Avir believes that the combination of features embodied by this French fighter render it superior to its principal antagonist in Middle Eastern skies. 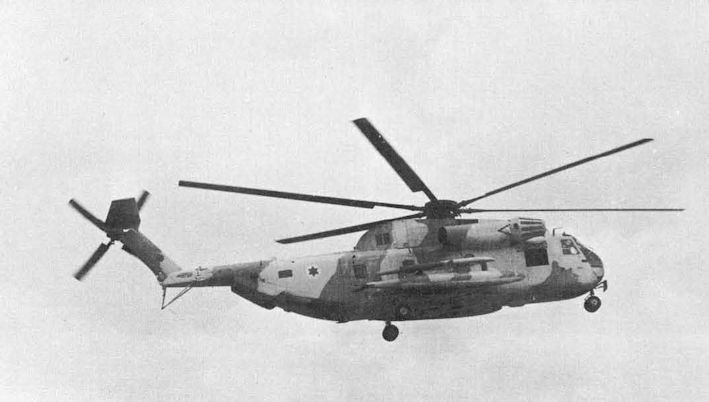 The Aerospatiale SA 321K Super Frelon was the largest helicopter in the Israeli inventory until the arrival of the S-65C-3. 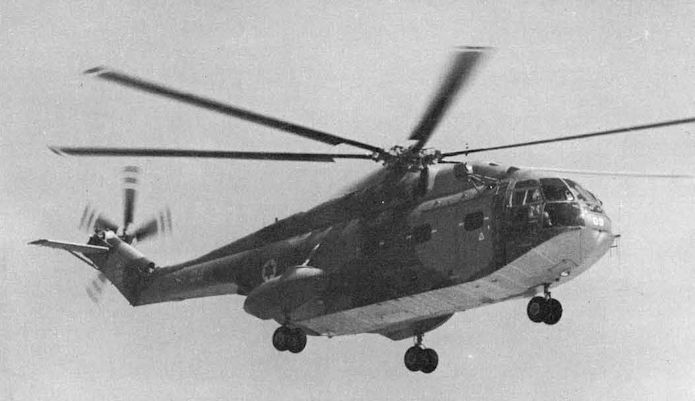 Heyl Ha’Avir originally planned to acquire 24 helicopters of this type, but the French embargo was imposed after the delivery of nine Super Frelons. One of the “straight transport’’ versions of the Boeing Stratocruiser that currently provide Heyl Ha’Avir with its principal heavy logistic support capability. One of these elderly Boeings flying over the Sinai was knocked down by an Egyptian SAM in September 1971. Numerically the Bell 205 Iroquois (not Agusta-Bell AB 205 as is often reported) is the most important helicopter of Heyl Ha’Avir, an example of this extremely versatile machine being illustrated here. The advent of the Sikorsky S-65C-3 in Israeli service has tremendously increased the vertical lift capability of Heyl Ha’Avir. 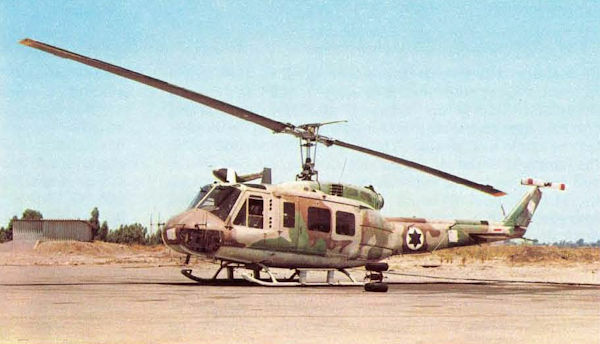 The Sikorsky S-65C-3 heavy-lift helicopter, one of the Heyl Ha’Avir examples of which is illustrated, has now been in Israeli service for some two years, making a spectacular operational debut on 26 December 1969 when it was used in the capture of an entire “Barlock” mobile radar installation. The Piper Super Cub has served Heyl Ha’Avir for many years in the primary training, liaison and spotting roles. Although the numbers in Israeli service have now diminished, it still fulfils grading and spotting tasks, and an example of this type is illustrated here. The Sud-Aviation Vautour IIA long-range attack aircraft shares with the Skyhawk and Phantom the main punch of Heyl Ha’Avir but is likely to be phased out of the inventory over the next year or so. One of the older but still very useful French combat aircraft in the Israeli inventory is the Super Mystere B2. It equips one squadron of Heyl Ha’Avir, and these fighters are likely to remain in service for some considerable time to come. The Nord 2501 Noratlas is used primarily as a paratroop transport but, on occasions, also serves in the target-towing role. The increased capability of Heyl Ha’Avir since the six-day war is due in no small part to the acquisition of the Phantom, the RF-4E reconnaissance model being illustrated. Each of the Heyl Ha’Avir Phantom squadrons is reported to include two RF-4Es in its inventory. Cessna U 206C Super Sky wagons, one of which is seen here, have been in Heyl Ha’ Avir service for some two years. These serve in the utility role and are equipped with a detachable glass-fibre Cargo-Pack which incorporates loading doors on the side and at the rear. The Super Skywagon is used primarily for light transport and liaison tasks, but can also serve in the casualty-evacuation role. One of the older but still very useful French combat aircraft in the Israeli inventory is the Mystere IVA. It equips one squadron of Heyl Ha’Avir, and these fighters are likely to remain in service for some considerable time to come. The increased capability of Heyl Ha’Avir since the six-day war is due in no small part to the acquisition of the Phantom, the F-4E version of which is seen.